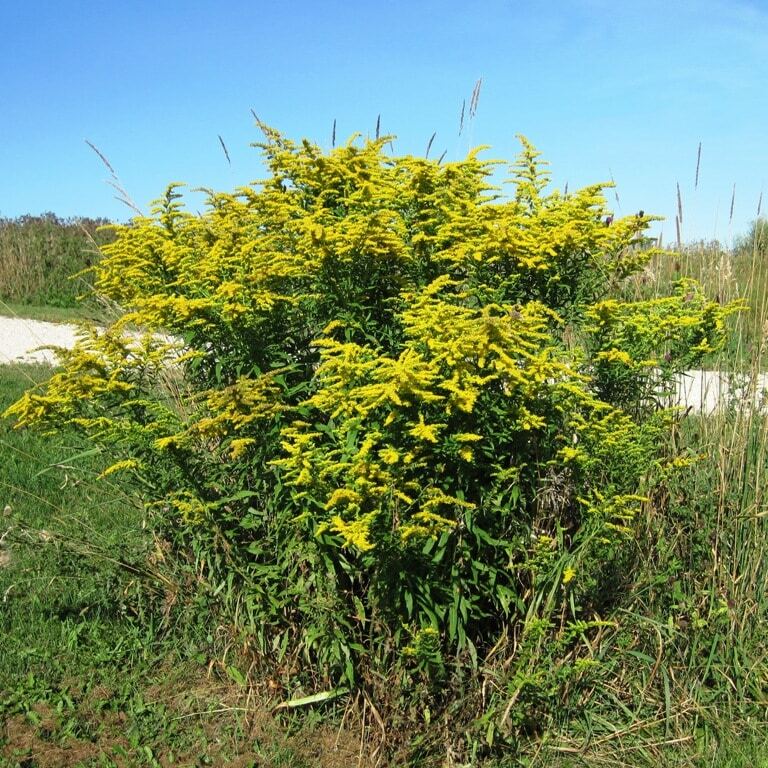 Today's featured plant is Canada goldenrod, Solidago canadensis. Canada goldenrod is also known as common goldenrod, tall goldenrod or Aaron's rod. This common weed is found throughout most of North America, from Alaska to Texas and all of Canada, not including a small portion of the southeast United States (see range map here). There are over 100 types of goldenrod in North America, and many of them look similar, so they can be difficult to identify. It is very common, growing along roadsides and other dry, sunny locations. It spreads through rhizomes, forming dense clumps that can create a monoculture in prairie areas. As a perennial, it returns year after year, spreading a little (or a lot) each year. The plants are around 2 to 5 feet (60-150 cm) tall, leaf type is simple, leaf attachment is alternate. Leaves are narrow and up to six inches (15 cm) long, and have teeth along the edges. Flowers are composite, and are borne in clusters along spikes. Wildflowers of Wisconsin states, “Goldenrod is pollinated by insects, including beetles, ambush bugs, flies, midges and bees, which are attracted to the flower's abundant nectar.” Below you can see a soldier beetle, a good beneficial insect for the garden, feeding on nectar. Soldier beetles also eat aphids. The stems of goldenrod are often invaded by insect larvae (see below), causing bumps or galls in the stem. I first read about using the insect larvae found in goldenrod stems in Countryside magazine. I haven't tried this myself (I don't fish much), but you can harvest these bumpy stems for free fishing bait. The video below explains how to identify and harvest the larvae. These replace the mealy worms typically sold for ice fishing. 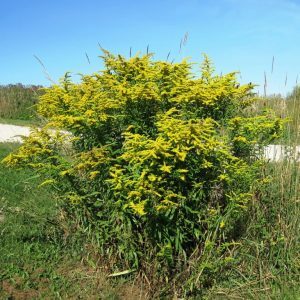 Although it is commonly blamed for hayfever and allergies because it blooms at the same time that many people experience these symptoms, only 1-2% of autumn airborne pollen is from goldenrod (see Wildflowers of Wisconsin). Ragweed is generally the real culprit. Some people may have a mild skin reaction (contact dermatitis) when exposed to goldenrod. I have not. Goldenrod has been an abundant, well-known medicinal herb for centuries, both in the Americas and in Europe, and has been used internally to treat a variety of ailments, including kidney stones, urinary tract infections, bladder inflammation, digestive problems, colds and flu, sore throat, laryngitis, fatigue, and surprisingly, hay fever and allergies. Externally, Native Americans boiled leaves and used them topically as an antiseptic and astringent for wound healing and relief from eczema, arthritis, and rheumatism. 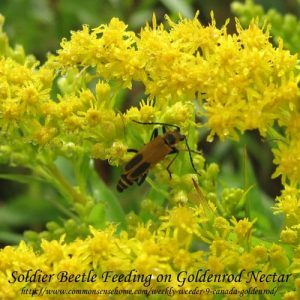 At this point in time, some research has been done on Goldenrod, and indeed, many of the medicinal qualities attributed to it through history seem to have some basis in fact. Although, in America we don't use Goldenrod much medicinally, the German Commission E (an expert committee formed to evaluate herbs and herbal combinations) has approved Goldenrod for bladder and kidney stones, and as a diuretic to help flush out urinary infections, and it is widely accepted in Europe for these problems. It has properties that do make it useful topically for wound healing, eczema, arthritis, and rheumatism, and as a tea or gargle, it has properties that make it a likely valid remedy for colds, flu, sore throat, and laryngitis. Tea made out of the leaves of Goldenrod (called Blue Mountain Tea) has been used by herbalists in the Appalachians for many years to relieve exhaustion and fatigue. Contraindications are few for Goldenrod, although those who are pregnant or have serious heart or kidney problems should steer clear. There are no known side effects either alone or with other drugs or herbs, but this has not been studied extensively. Minor allergic reactions could occur in some people. To make a tea to use internally, please see the How to Make Herbal Tea section of this site. Dosage is 2-3 cups per day, or as often as needed if using it for gargling. The tea is actually rather tasty, with an anise-like taste and aroma. For external use, either crush the leaves and rub them on the skin, or visit the How to Make Herbal Oils and Ointments section of these pages. Again, some people may have a minor allergic reaction if rubbing crushed leaves or a preparation directly on the skin so proceed with appropriate caution. Please do visit their site for additional information. 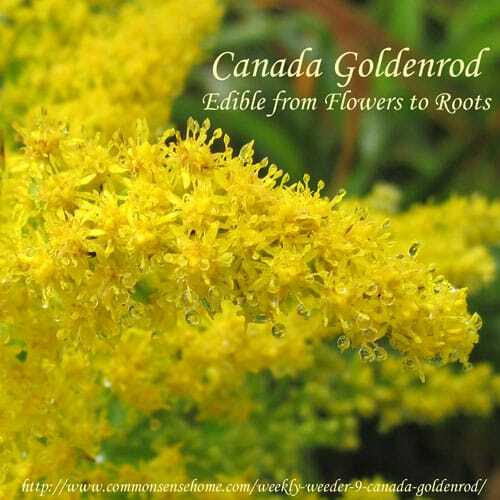 Canada goldenrod can also be used to dye fabrics. Dot's Fibre to Fabric site has a lovely article entitled “Dyeing with Goldenrod” where they share their experience dying with goldenrod using the techniques described in “A Dyer's Manual“. The range of colors shown in the photos is very interesting. Throughout winter, late-blooming goldenrod flowers, goldenrod seed and even goldenrod leaves (albeit browned) are available. All three can be picked on demand and used to make an infusion (like a tea), or boiled in a variety of soups. The best soups are vegetable soups and other thin soups, but the taste of cream soups is greatly enhanced with a handful of goldenrod flowers or pulverized seeds. In the spring, as soon as the frost is out of the ground (or in the early fall, after the nutrition and liquids of the plant have partially retreated), harvest the roots. Wash them thoroughly, dry them and grind them coarsely for use in soups and batter. In the spring and summer, pick up to one third of the leaves of each plant for use in salads, or, again, use in soups. Leaves and flowers can be air-dried and stored almost indefinitely, or the leaves and flowers may be frozen with a little water for use later. The stalks, too, can be used, although they tend to be tough. With care, they can be peeled, or harvested when young. By dipping them in a little honey or sugar/water mix and then baking in the oven at 225F for up to forty-five minutes, you can make a crispy sweet snack that can be broken into smaller pieces and carried with you on hikes, for quick nourishment. I encourage you to view the post in its entirety, as they also include goldenrod recipes. View the rest of the posts in the Weekly Weeder series on the Herbs and Wildcrafting page. Thank-you for this post. As I write this I am viewing about 12 acres of goldenrod. I enjoy them, as beauty not a said weed. When I went to Germany to visit my Oma when I was about 10 years old she asked me to weed her garden. I pulled out all the Golden rod and got a spanking for removing her beautiful 'imported' flowers. All in the eyes of the beholder! I now enjoy them as much as she did. We have quite a bit of goldenrod around here, too. That reminds me of a story my neighbor told me, about how her grandmother sent them out to pick currants, and they picked individual berries and threw the stems away. Their grandmother was very upset, as it is the stems that contain the pectin to make the jelly set. Great post Laurie! 🙂 Thanks for sharing on Wildcrafting Wednesday. I just pulled wool out of the dyepot yesterday that I had dyed using goldenrod. I got an intense golden yellow with a nice lemon yellow on the exhaust bath. I’ll have to share the tip about the galls with my ice-fishermen.